Liquid metal and holographic eyeshadows. Very intriguing. • Creamy Eyes (numbered E103 to E109) are mattes and mainly neutral shades. 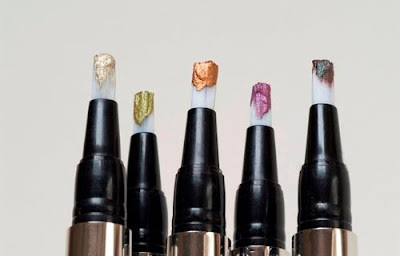 • Milky Eyes (numbered E203 to E209) are essentially mattes but with the slightest hint of shimmer, and has a more colourful shade range than Creamy Eyes. To say that they are all amazingly longlasting eyeshadows is like giving you old news now. 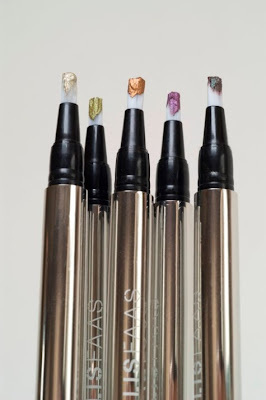 In the near future, ELLIS FAAS will also provide you with shimmery powders, holographic and metal shimmers, plus various glosses to give your look a more festive appearance. Well, ladies (and gentlemen), part of that future has arrived. These are the new ELLIS EYES Lights (image courtesy of ELLIS FAAS). Dutch makeup artist extraordinaire, Ellis Faas, has created the Lights to go hand-in-hand with the existing eyeshadow collection, to create "infinite possibilities to play with shadow and light - which is exactly what applying makeup is all about". Ahh, even the great Rembrandt would nod with approval. But that word 'holographic' still baffled me. On the web, I've seen the word 'holographic' used on eyeshadows before, but most times, they just fell short of expectations. The one on the left is E301. It looks like having a metallic sheet on skin. I tried a bit on the eyes and it felt lightweight. The one on the right is E305. This was the one that knocked me off my feet. It's holographic! Holy moly! I mean, watch how the colour changes as I rotate my arm towards the camera. I shan't say more for now. I will, of course, need time to properly test them out. A review on these eye-popping Lights will follow soon. Apologies to my Australian readers. I haven't got the official retail price in AUD yet. The ELLIS EYES Lights range launches today in Liberty, London. In Edinburgh and Europe (including the Netherlands), it will be available starting 21st June. For ladies living outside Europe, the launch dates in the rest of the world are yet to be confirmed, but it will be sometime after 21st June. To find out where ELLIS FAAS products are available, please check the list of stores on theirwebsite. For more specific and up-todate information, especially about the launch dates of the Lights outside Europe, ELLIS FAAS advises joining them on Facebook (there, you'll see fabulous pictures of E301 - E305 applied on the eye, by the way) and/or subscribing to their e-newsletter. These are the most convenient means of receiving accurate updates from them. Seen like this, E305 reminds me of MAC pigment "Blue Brown" (a warm chocolate brown with strong aqua duochrome - going from brown to blue depending the angle). So E305, holo or duochrome? Oh. My. Gosh. Beautiful doesn't even begin to describe these swatches. OMG - amazing! I want these!! Such pretty colors, especially the lilac! I do like the holographic one. I have a pigment just like it. It reminds me of shot silk. My jaw just dropped when I saw the price for just one. Is it really worth it? Looking forward to hearing your thoughts! warm silver look sooo pretty! I love those eyes shadow. Very pretty! Can it be both? :D And I'm afraid I can't personally compare E305 with the pigment of MAC's that you mentioned. I haven't got it myself. Ellis Faas is working on remedying that! Have not seen such gorgeous eyeshadows before. I am such an eyeshadow freak, have so many types and shades of eyeshadows, but really, never saw anything like that! I don't think I will be able to sit tight nor sleep well till I could get my hands on this...err....may be on all of them. But the price....oppsss.... But I just can't choose 1 or 2, because I like all the 5 shades. 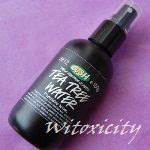 Seems to be a great product, the colors are stunning !! I appreciate the fact that the different prices are accurate to the exchange rate !